The official English name is "Korean Traditional Liquor Grand Festival," a direct translation of the Korean, but it's a little misleading. 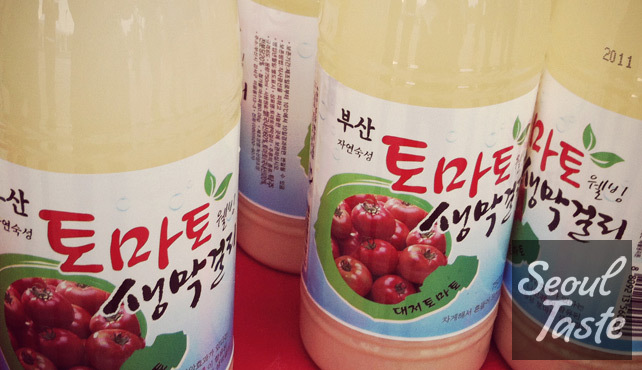 "Traditional liquor" might bring to mind many kinds of drinks, but the only one you'll find here is makgeolli, the milky white, sweet & sour, unfiltered "rice beer." For those who haven't tried it, it's a whole lot better than it sounds. For those who have, you've probably only tried a handful of varieties, so take this opportunity to try dozens! If you can somehow decide on a few favorites, bottles are available for purchase (at rock-bottom prices). Some booths (e.g. new producers) even give away free bottles to anyone who'll take them. If you can get to the south gate of Seoul World Cup Stadium (not Suwon or Gwangju), you'll be almost there. (By subway, Line 6 World Cup Stadium station exit #1 should work) Just cross the street and head to the end of the parking lot or the end of the long elevated walkway leading out of the stadium and you'll find a stage next to a lake. The stage marks the middle of the festival grounds, booths extend in a straight line in either direction from there. Assuming things work the way they did last year, start by finding the booth that sells cups (if you get desperate, "cup" or "makgeolli-jan" should help people point you in the right direction). They will be around 5000 won, but it works like a deposit (you can return the cup at the end and get your money back). Alternately, you can keep the cup as a souvenir. The food last year was inexpensive and filling, but decidedly mediocre in quality, and there was a looong line at the solitary food booth next to the stage. But you'll probably be too busy drinking to notice. Speaking of the stage, there were a few events to watch while eating or taking a break from drinking, but nothing memorable. The stage does make a good gathering place if you're meeting someone there. That's all for now. If there's anything else you're curious about, let me know in the comments and I'll do my best!